Today is California Strawberry Day. It's also the first day of Spring, so it's a great day to celebrate! California is the nation's leading producer of strawberries. The coast of California has a unique environment with its western ocean exposure with moderate temperatures year round -- warm sunny days and cool foggy nights - the perfect combination for growing delicious, beautiful strawberries! Last year on California Strawberry Day, I posted a recipe for Strawberry Chocolate German Pancake. I've also posted recipes for Chocolate Strawberry Shortcake, Chocolate Covered Stuffed Strawberries, and 'regular' Chocolate Covered Strawberries. There have been others, too. Visit California Strawberries for more facts, recipes, and apps. 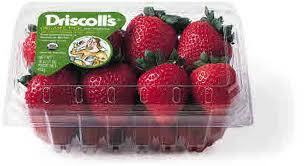 I find that in the market, I can always depend on Driscoll's for fresh delicious California Strawberries, so it's no surprise I consult their website for special strawberry recipes (and other berries). 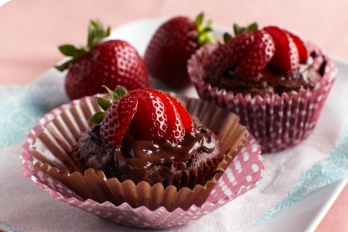 In this recipe for Strawberry Extra-Chocolatey Brownies (recipe adapted from Driscoll's website), chopped strawberries add a fresh touch of fruity tartness to rich fudgy brownies. This is a quick and easy recipe. Use the finest ingredients-- California Strawberries, the best chocolate-- and you'll have a winner! 1. Preheat oven to 350°F. Butter 12 muffin cups, or coat with cooking spray. 2. Rinse and dry strawberries. Stem and chop 8 ounces berries (half the container, 1-1/2 cups chopped), reserving the smallest berries for garnishing. 4. Stir in sugar, eggs and vanilla. 5. Mix in flour, chopped strawberries, stirring just until combined. 6. Scoop batter into muffin cups, filling one half full. 7. Bake 15-17 minutes until brownies are just set on top and no longer shiny. Remove from oven and sprinkle about 1-1/2 teaspoons chocolate chips (or chopped chocolate) on tops. Return to oven 1-2 minutes until chocolate softens. Spread chocolate with the back of a teaspoon or knife. 8. Cool completely in pan. Run a knife around edges and lift to remove from pan. Before serving, halve remaining strawberries and place one on top of each brownie. 1. Use a 8-inch square pan instead of muffin pan. Bake 25-30 minutes as directed above. At end of bake time sprinkle chocolate chips on top; return to oven for 1-2 minutes. Evenly spread chocolate. Cool. Cut into squares and garnish with strawberries. In the mean time, boy oh boy does your that extra chocolatey brownie sound good!!! Your strawberry brownies look delectable! We brought home the most beautiful berries from the market today - the first of the season and they are remarkable. what did you make with the strawberries? or did you just eat them? So delicious looking! A wonderful combo. Wey hey, strawberries in a brownie - that has just got to be tried.